Whatever others around you think, don’t you ever be ashamed of being a Christian. Let them laugh, mock, jest, and scoff, if they will. They will not scoff in the hour of death and in the day of judgment. Hoist your flag; show your colors; nail them to the mast. You may certainly be ashamed of drinking, gambling, lying, swearing, idleness, pride, and failing to go to church on the Lord’s Day. But of reading the Bible, praying, and belonging to Christ, you have no cause to be ashamed at all. Let those laugh that will. A good soldier is never ashamed of the colors of his nation’s flag, and his uniform. Be careful that you are never ashamed of your Master. ~ J.C. Ryle, Practical Religion, “Our Home”, [Carlisle, PA: Banner of Truth, 1998], 401. Bishop Ryle's critique of "ritualism" was way over the top, but the man has seldom been equaled in his zeal for the Gospel and his incisive way of convicting a believer. The Rt. Rev. 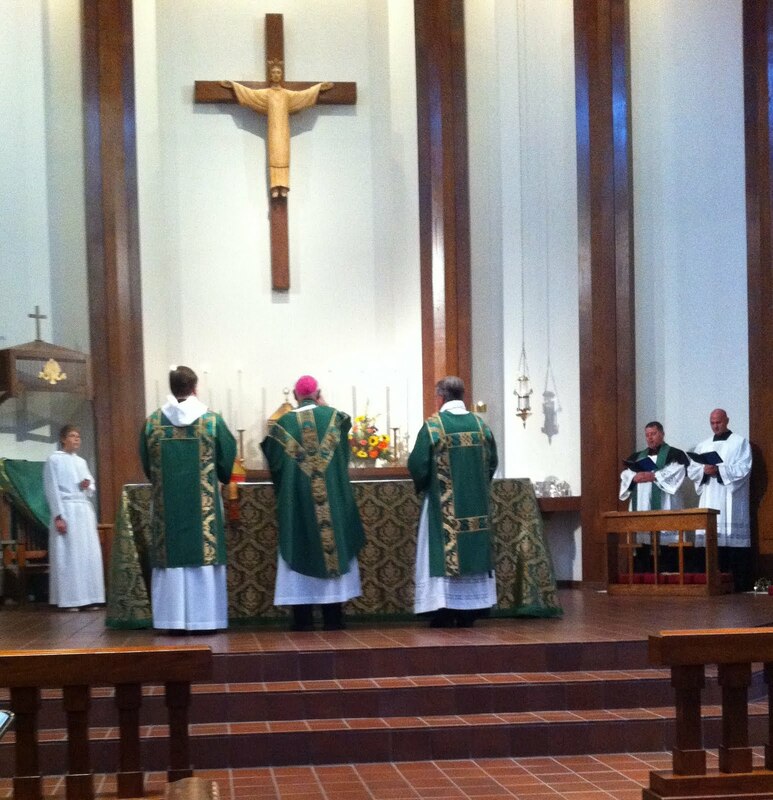 William Wantland, retired bishop of Eau Claire and our assisting bishop in the diocese of Fort Worth, celebrated the thirtieth anniversary of his consecration as a bishop with us at St. Vincent's Cathedral today. He preached a spirited homily and celebrated the 9AM Eucharist. 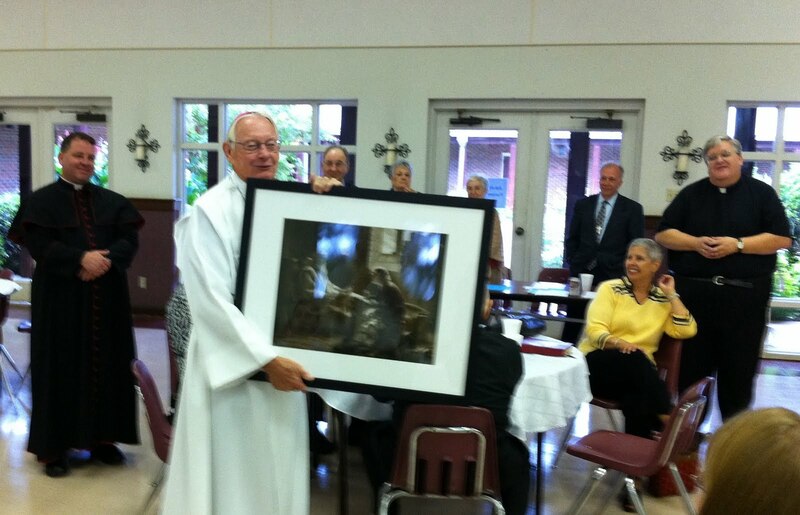 Bishop Wantland was honored with a reception at which he was presented with many gifts and cards from around the diocese. 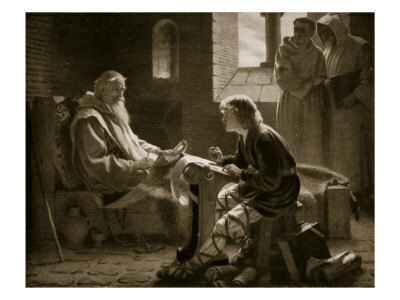 The people of St. Vincent's also presented the good bishop with a framed picture of the Venerable Bede dictating one of his masterworks during his senior years. It was a fitting gift for a man who, like Bede, is a scholar and defender of the faith and a very capable apologist for the Anglican expression of the catholic Faith. Thank you for your many years of service to the Kingdom, your grace! Today St. Vincent's Cathedral had the honor of a visit by Archbishop Mouneer Anis of the Anglican Province of Jerusalem and the Middle East (++Anis is standing to my right in the photo above, in front of Dean Ryan Reed). The good archbishop preached at our 9AM and 11:30AM services and addressed our Adult Forum on topics related to the Anglican Communion's state of crisis and the present state of Christianity in his home country, Egypt. It was a delightful visit and we thank Archbishop Anis warmly for taking time to visit us and speak. He is a stalwart defender of "the Faith once delivered to the saints" and certainly deserves our prayerful support in his ministry. Tomorrow the archbishop will join others, including Archbishop Robert Duncan, in speaking to the clergy of our diocese. They are in town for the annual meeting of the Board of Trustees of the Anglican Relief and Development Fund. Your prayers for the assembled archbishops and the other leaders of the ARDF would also be greatly appreciated. 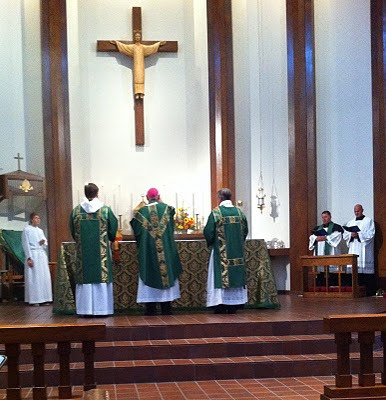 Last night, the feast of the Holy Cross, marked the third anniversary of my ordination as a presbyter in Christ's one, holy, catholic, and apostolic Church. It has been an astonishing three years. 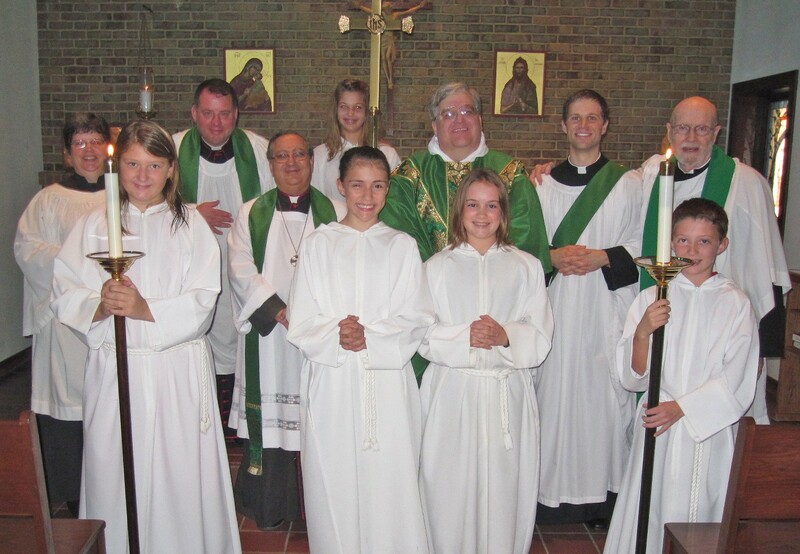 There have been so many people in the parish of St. Vincent's Cathedral Church, and especially at St. Vincent's School, who have played a crucial role in my growth as a priest. Last night I hosted a dinner party to which I invited a number of the SVS students and alumni who have played an extraordinary role in my development as a teacher over the last seven years and as chaplain to the school over the last three years. While a few of those wonderful students have moved away and others were unable to attend last night due to athletic commitments at their present high schools, the majority of those kids I credit with playing a pivotal role in making me the priest and teacher that I am today honored me and humbled me by giving up their time to come and help me celebrate. It has been a long time since I have been this happy, surrounded by so many of my "best and brightest." Thank you, my dear brothers and sisters in Christ. Thank you for all you have done for me as a minister and a person. Thank you for allowing me to continue to play a small role in your lives. And thank you to their wonderful parents for all their support. Thank you all from the bottom of my heart! And most importantly, I thank our Lord Jesus Christ for allowing me to serve Him in such a marvelous church and school community. I am truly blessed! Hat tip to Stand Firm!